I will bet that Vitauts always thought of Halloween as a special occasion. After all, it’s the day before his birthday. Yes, the life-long pastor was born on All Saints Day. Coincidence? Maybe. Last night was the first time that I’ve spent Halloween with my father since, well, maybe since forever. When we were little, we were out Trick-or-Treating. When I was old enough to drive, I’m sure I went out with friends. Then there was college, my marriage, my own kids, and so on. He moved in with me last November, so this was our first official Halloween. I told him that we’d probably have kids over, and that I was going to leave to go to a party, so he would have to hand out candy while I was gone. He panicked a little bit. “How do I give candy? How much do I give?” I told him to hand them the bowl and let them take one or two. “No,” he said, “they should have four or five!” I tried explaining that the parents probably coached their kids to only take one, but whatever. Let Vitauts hand out as much candy as he wants! So our first group of kids showed up at about 6:30 p.m. 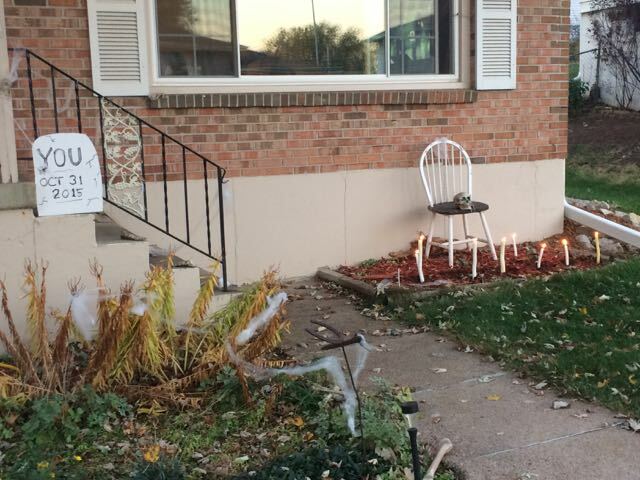 They had to navigate the cobwebs and candles that I had put in front of the house. 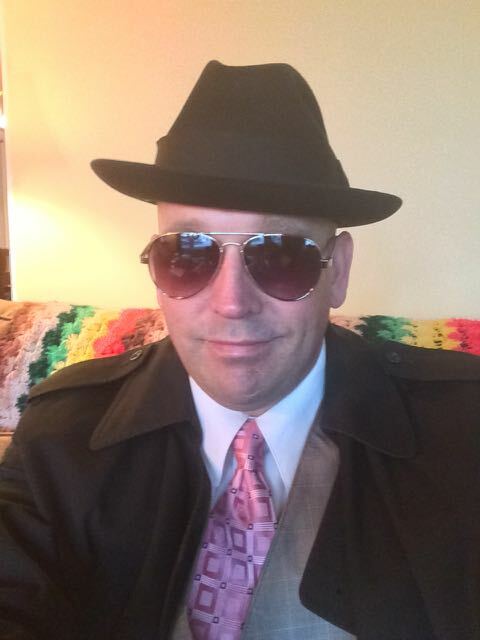 I opened the door in my Raymond Reddington costume and held out the bowl for them. Dad watched eagerly to see how I had done it. I turned on the living room television for him, so he wouldn’t have to walk from his room to the door over and over again. I sat at the kitchen table eating some supper when the next group came to the door. “Can you answer?” he pleaded. “No, dad, you get it. You’ve got this!” I replied. more,” I could hear him say. He talked to the kids and the parents for quite awhile, laughing and gesticulating. Finally, he turned around to come back inside with this big smile on his face. “Can you answer the door next time?” He asked again. I couldn’t figure out why he was so nervous when he was having so much fun! I told him that I had to leave soon and get ready, so he was in charge of the door. As I was leaving, he stood on the porch coaxing little kids to come to the door. His Latvian accent and pulpit voice cut through the beautiful October night, “Come, come! Have some candy!” I wonder if the people walking by thought that he was playing a character, maybe even wearing a mask. “The Old Latvian Man” costume? I thought he would make a perfect Dracula with his natural accent. 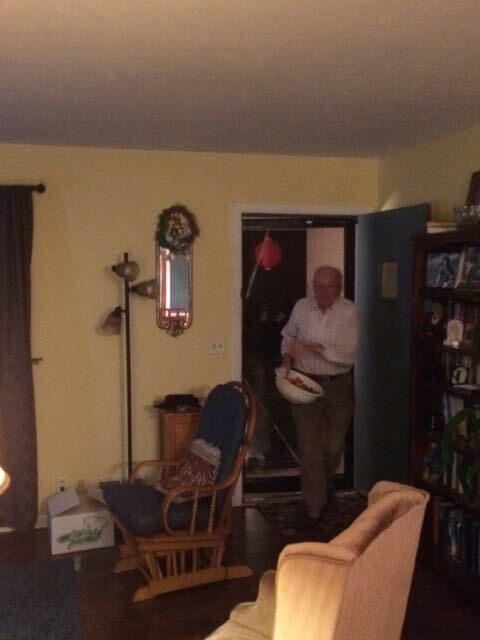 When I came home later that night, he was already asleep, and most of the candy in the bowl was gone, so I assumed he had continued to answer the door. Either that, or he just gave all the candy away to the next kid who showed up, so he wouldn’t have to do it anymore.